Kalamazoo’s Western Michigan University Wednesday announced it has opened its 15,000-square-foot AMP Lab in downtown Grand Rapids. The Advanced Manufacturing Partnership Laboratory comes a year after the university announced a collaborative effort with Grand Rapids Community College and western Michigan manufacturers to address talent needs in the manufacturing industry. The lab occupies the first two floors of WMU’s downtown Grand Rapids location. Students can earn credits toward a degree or certification at the lab, which offers prototyping, training, and small-scale manufacturing. It has 3-D printers and scanners, and CAD/CAM lab, plasma cutter, laser cutter, welding station, metrology equipment, and prototyping tools. Early this month, the community college began using the space three days a week for its AMP program cohorts. 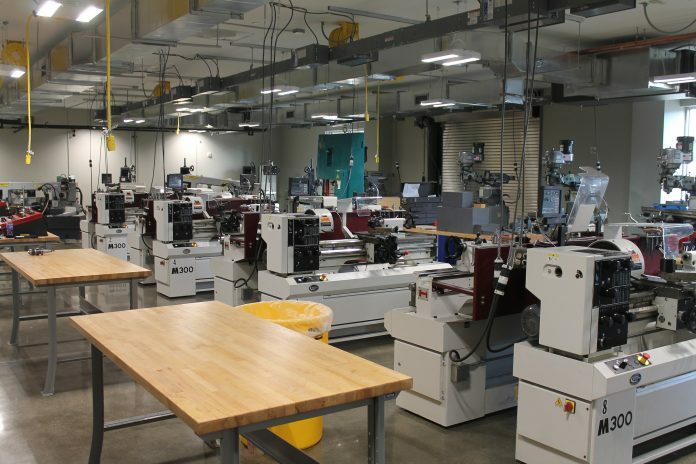 In January, WMU will offer courses for a certificate program in integrated design and manufacturing. In addition, manufacturing engineering technology, engineering design technology, and engineering management technology courses will be offered at the facility for students enrolled in WMU’s engineering technology degree program. The $2.7-million lab development and its equipment were partially funded through private investment and the Michigan Economic Development Corp. The space can also be used by entrepreneurs who need manufacturing assistance. The building that houses the lab began as the Brown and Sehler Co., a wholesale manufacturer of horse harnesses and collars from 1925-1935. Various businesses moved in and out of the building for the next 40 years before H.H. Cutler Co., an infant and children’s clothing manufacturer, occupied the space until 1995. The University moved into the building in May 2001.